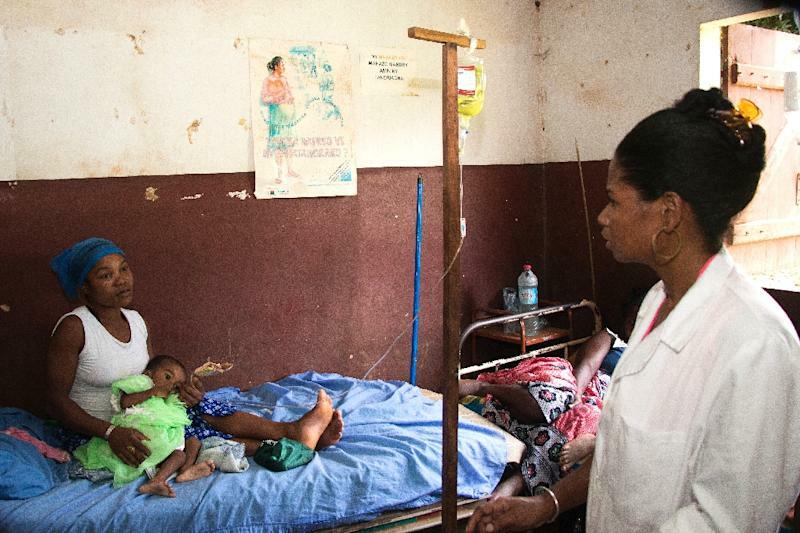 Antsiranana (Madagascar) (AFP) - Frangeline is aged two but weighs no more than a four-month-old -- the terrible result of her battle with measles, which is cutting a deadly swathe through Madagascar. Widespread malnutrition and low rates of immunisation on the Indian Ocean island have ramped up the killing power of the highly infectious virus. In the last six months, nearly 1,000 children have been killed by a resurgent disease that vaccination once appeared to have tamed. Now on a drip, the scrawny infant was only saved because her mother Soa Robertine, 32, made the 25-kilometre (15-mile) trek from her home to the Anivorano-nord health centre, in the island's far north. Without her timely action, respiratory or neurological complications arising from the virus would have proved fatal, doctors said. "Frangeline is suffering severe malnutrition and she wasn't vaccinated" against measles," said the clinic's head of medicine, Hollande Robisoa. "She contracted a complicated form of measles and she would have died if she hadn't been brought here." Many other children have not been so lucky. Between last September and February, there were more than 79,000 cases of measles in Madagascar, 926 of which were fatal, according to the World Health Organization (WHO). The Anivorano-nord clinic has had 510 patients suffering from "kitrotro" and "kisaosy" -- the local names for measles. Roughly 100 patients were hospitalised but only four lost their lives, according to official statistics. But many local people dispute the numbers in a community where rumours are common. "I heard that hundreds of children have already died," said Sylvain Randriamaro, 46, sitting in the hospital waiting room. "I was alarmed, so I decided to vaccinate my two children," aged five and six, he said. Measles has hit Madagascar barely a year after it was gripped by an outbreak of plague that claimed 200 lives. "It's a major epidemic," said doctor Vincent Sodjinou, a WHO representative. "It's down to the fact that for almost a decade the rate of vaccine coverage was not high enough and, over generations, the numbers of unvaccinated people have increased." Measles can be relatively benign if symptoms like fever and cough are handled promptly. If not, there is a risk of "opportunistic" illness such as pneumonia or diarrhoea -- diseases that can fatally attack patients with weak immune systems. 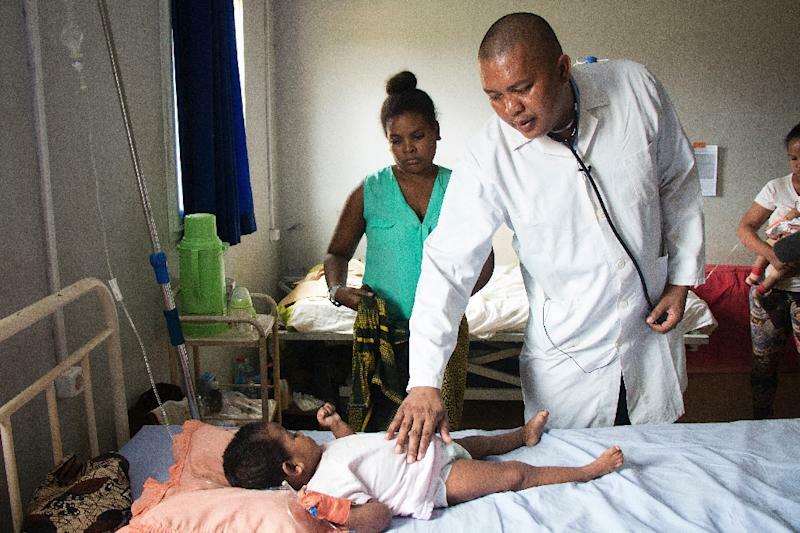 In Madagascar, where 47 percent of children under five are malnourished, the disease has proved particularly dangerous. "It's often said that malnutrition makes a bed for measles," said Sodjinou. "The most serious cases are often reported in malnourished children." The paediatric ward at Antsiranana's military hospital, north of Anivorano, has been overwhelmed. "Normally we only treat one measles case here every two months," said head of medicine Ravohavy Setriny Mahatsangy. "We've had 444 just since December." Mahatsangy blamed physical contact between patients, their "reluctance to go to hospital and opposition to vaccinations". The combination of factors has wrought a tragic toll on his patients. One example is Marie Lydia Zafisoa, aged eight, whose "mother took her to a witchdoctor... and then a traditional healer who prescribed six baths," according to her aunt Bana Tombo. When that failed, Zafisoa's father carried her to the clinic. "It was too late -- she died on the way, on her father's shoulders," said Tombo. Seven-month-old Adriano Luc Rakototsioharana was more fortunate. Her grandmother Catherine had also turned to traditional medicine before taking her to hospital. She barely survived the ordeal -- but even so, Catherine remains adamant that traditional medicine holds the key. "For measles, you need a cow dung infusion or a tea with bark from the lazalaza tree," she said. Doctors say that such beliefs are frustrating their efforts to roll back the disease. "It's the culture," Ravohavy said, with a resigned smile. "Changing people's mentality is far more difficult than treating measles." The profession also complains that the situation is worsening despite the state paying for most measles treatment. "But the people prefer traditional healers who often advise them to refuse any hospitalisation," said a health ministry official, doctor Said Borohany. "And most villages are hours away from basic medical centres." The other viable solution, vaccinations, has been complicated by the lack of funds available for such a programme. Until now the nation's vaccination programme has administered only a single dose when the WHO recommends two. The UN agency estimates that 5.6 million doses would be needed to contain the epidemic. But Madagascar is $1.6 million (1.42 million euros) short of the $11.2 million needed to fund such an operation. Newly-elected President Andry Rajoelina has promised to vaccinate all children aged between six months and nine years. "Our goal is to eradicate measles," he said. But the fight will be long and difficult. 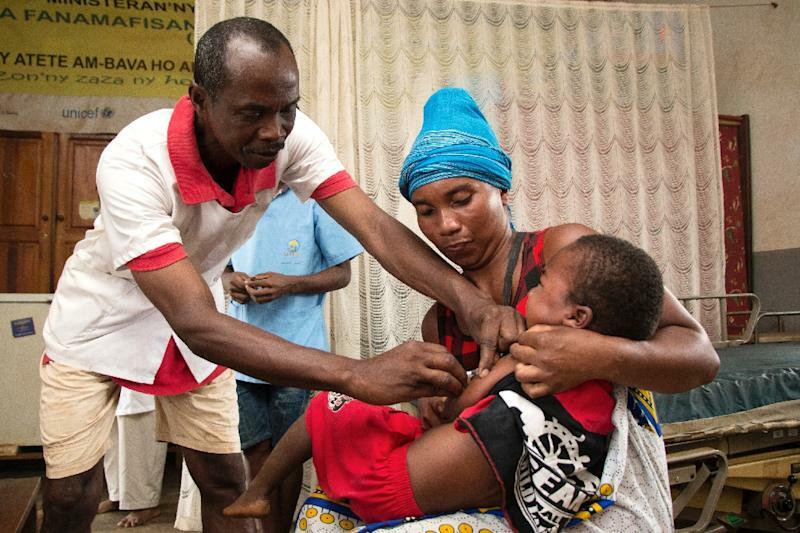 "Madagascar put in place a routine vaccination programme," said the WHO envoy, Sodjinou. "But it remains inadequate to reach the furthest reaches of the country."